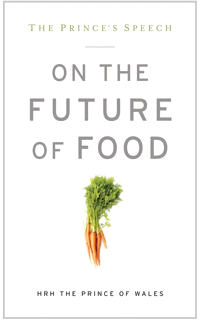 The Prince’s Speech: On the Future of Food (Rodale 2012) is a slim book by HRH The Prince of Wales that contains a speech delivered in Washington DC on May 4, 2011, as well as a forward by Wendell Berry and an afterword by Will Allen and Eric Schlosser. The speech itself is 33 pages long, with a few of those pages filled with explanatory photos. Short as it is, and perhaps because of that limited length, it should be read by every school child. It is a stepping off point for a wider discussion our world needs to have about sustainability, global warming, and population. We listen to celebrities, and the Prince is certainly a celebrity, and what he says in the speech should be common sense. But the question is open – do more celebrities need to join the cause before we really pay attention? Ideally, celebrity actors and models who have joined the fight against foie gras – could re-direct their clout for the Prince’s concerns. HRH covers the need to feed more people, our dependence on fossil fuel, declining yields of staple crops leading to social unrest, demands on fresh water, and the growing number of acres of farmland that are lost to cultivation. The only solution, he believes, is sustainable farming practices. The Prince brings up Michelle Obama‘s contribution in her Let’s Move campaign (p. 18). It is easy to imagine Prince Charles appealing to the First Lady to have a word with her husband to create the kind of “accounting for sustainability” that he describes (p. 28) “…to expand their accounting process so that it incorporates the interconnected impact of financial, environmental, and social elements on their long-term performance.” This would truly take into account the real cost of food production and bring into balance the relatively expensive cost of conventionally grown food, and the relatively cheap cost of sustainably grown food. Unfortunately, there seems to have been no earth shattering change to US policy since the speech was given to indicate that the First Lady ever had a tete a tete with her husband. HRH calls for a new Washington consensus, “We need to include in the bottom line, the true cost of food production…” (p. 29). He sees the need for a consensus among the public, private, NGO sectors, corporations, and small industry to build a new partnership to address the crisis in food production. He also admits that cheap, subsidized food will be difficult to wean ourselves from, even with the mounting evidence of the harm commercial subsidized farming has done to our environment and health. By weaning big commercial farms off subsidies and encouraging small, local sustainable farms, food prices could be stabilized during the shift to better farming methods. Get On the Future of Food, read it with your kids, and consider what you can do to join the Prince.